Born in Marseille, France, I got my MS degree at the Aix-Marseille University (AMU) in materials science and microelectronic engineering in 2010. I then did a Ph.D. in the materials science department of the Institut Matériaux Microélectronique Nanosciences de Provence (IM2NP) laboratory, again at Aix-Marseille University, and obtained it in January 2014. My Ph.D subject was to study the atomic redistribution of metallic contaminants in silicon and near a SiO2/Si interface during microelectronic process. This work was conducted in the frame of the COMET project. To conduct this study, I used three characterization techniques which were: the Atom Probe Tomography (APT), Transmission Electron Microscopy (TEM) and Secondary Ion Mass Spectrometry (SIMS). The use of these three techniques allowed me to investigate the chemical distribution of the contaminants close to the SiO2/Si interface, measure the chemical composition of precipitates and identify their crystalline structures. I have investigated the diffusion, segregation and precipitation of five metallic contaminants (W, Fe, Mo, Ni and Au) during diffusion annealing and oxidation annealing of the silicon contaminated wafers. 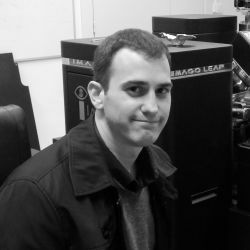 After this Ph.D was completed, I switched from microelectronic subject to Metallurgy when I joined both the Dunand and Seidman research groups, as a postdoctoral fellow on a joint project between Northwestern University and Ford. My job here is to engineer a new high-temperature light-weight precipitation-hardened aluminum alloy. I investigate the properties of alloy by means of microhardness and creep measurement. In order to understand more precisely which of the different possible mechanism for precipitation hardening is responsible for the increase in hardness, atom probe tomography is performed to obtain the chemical compositions, sizes and distributions of nano-scale precipitates. De Luca, A., Portavoce, A., Texier, M., Burle, N., Mangelinck, D., & Isella, G. (2017). First stages of Ni reaction with the Si (Ge) alloy. Journal of Alloys and Compounds, 695, 2799-2811. Erdeniz, D., Nasim, W., Malik, J., Yost, A. R., Park, S., De Luca, A., ... & Dunand, D. C. (2017). Corrigendum to “Effect of vanadium micro-alloying on the microstructural evolution and creep behavior of Al-Er-Sc-Zr-Si alloys”[Acta Materialia 124 (2017) 501–512](S1359645416309004)(10.1016/j. actamat. 2016.11. 033). Acta Materialia, 133. De Luca, A., Texier, M., Portavoce, A., Burle, N., Grosjean, C., Morata, S., & Michel, F. (2015). Mechanism of ß-FeSi2 precipitates growth-and-dissolution and pyramidal defects' formation during oxidation of Fe-contaminated silicon wafers. Journal of Applied Physics, 117(11), 115302. "Atomic redistribution of implanted Fe and associated defects around moving SiO2/Si interfaces" A. De Luca, N. Burle, A. Portavoce, C. Grosjean, S. Morata, M. Texier, Physica Status Solidi c 12 (2015) 1166-1169 doi:10.1002/pssc.201400233. M. Texier, A. De Luca, B. Pichaud, M. Jublot, C. Tromas, J.L. Demenet, J. Rabier, ”Evidence of perfect dislocations’glide in nanoindented 4H-SiC”, Journal of Physics: Conference Series 471 (2013) 012013, doi:10.1088/1742-6596/471/1/012013.